rescuing some of them to bring inside. all huddled together in a crystal candy dish. some additional images that are actually from out in the garden. 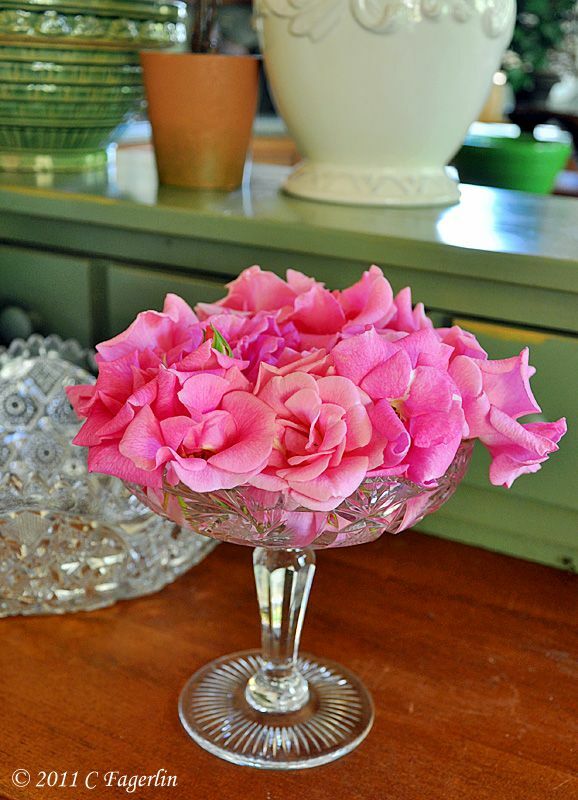 what a sweet idea to present the roses in that crystal bowl. Very nice vignette. I hope you had a blessed Easter time. they are gorgeous in that container! LOL they do look like crushed velvet!!! Pretty in the candy dish. Hope you get that sunhine later today and tomorrow. I am hoping for some SUNSHINE today....still pretty soggy from yesterday's most recent drenching rainstorm. I am soooo very ready for some warmer weather and playtime in the garden. Thanks for the sweet comments and I'm glad you enjoyed your visit with Pinky! Beautiful pink roses. I found you at MsGreenthumbjean and glad I did. Thanks, I hope you'll return again soon to visit.